If you really want a holiday treat that will make people smile, you've got to incorporate a little pop culture. And by "pop" I mean "pop-tart"--of course. 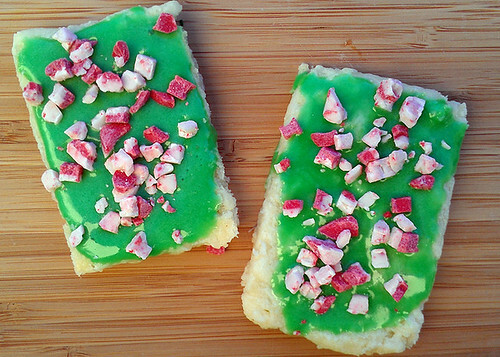 As in, homemade holiday Pop-tarts! This is a holiday-hued adaptation of a recipe I made a few years back for homemade tarts. No, there's not much different other than the coloring and minty flavoring, but this holiday dress-up of a familiar treat is nonetheless quite a bit of fun. This is also my entry for my sweet friend Molly's "virtual" holiday treat party. What's that, you ask? Well, I urge you to find more holiday treats, as well as a giveaway, at www.cakefyi.com. But in the meantime--here's the recipe for those tarts. Preheat oven to 450°F. Line a baking sheet with parchment paper; set to the side. Combine flour and salt in a large bowl. Add butter and blend with a fork, pastry cutter, or your impeccably clean hands. Blend until the mixture is fairly coarse. Add the water, bit by bit, gently mixing the dough after each addition, until the dough is cohesive enough to form a ball. Place dough on a lightly floured surface and roll into a rectangle, about 1/8 inch thick. Cut out rectangles approximately the size of index cards (3x5 inches), or smaller if you prefer a more modest portion (I didn't). Make sure you have an even number of cutouts. I think that mine might have been a little thicker than 1/8 an inch, but I ended up with 12 rectangles (for 6 pastries). On half of the rectangles, place a small spoonful of the jam of your choice in the center. You don't want it to be too thick or the top crust will mound on top of it. Place the remaining rectangles of dough on top of the ones with jam. Crimp all four edges by hand or with a fork to ensure that your filling won't ooze out. I also poked the top of each with a fork, to vent them. Place the tarts on your prepared baking sheet, and bake for 7 to 8 minutes, or until light golden on the edges. Remove from the oven and let them cool completely. While the tarts cool, prepare your icing; make sure it is fairly thin but not so thin that it will just drip off. If desired, tint with food coloring. Once the pop tarts are cool, drizzle it on top. Garnish with sprinkles or holiday-hued treats.